Somebody take my debit card -- PLEASE! The Internet is a bad place. 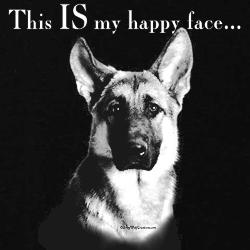 I just bought another GSD shirt on CafePress. It's cute. See ==> I've also ordered two German shepherd related books from Amazon in the past 2 weeks -- and neither has showed up yet. Grrr. I'm going batty waiting for the puppy to get here. I guess I could be cleaning/puppy proofing the house in preparation. Nah, shopping is more fun . . . Happy news though. Work finally hired a second animal control officer (after eight months). I told my boss that the new officer needs to be up and running by late November because I'm taking three weeks off when the puppy comes. We need to bond and I want to start potty training off right. Also, I really need some time off -- why not spend it with a puppy?! Hard to resist cool things for our babies. Glad you finally have a co worker. How is the name search going?